QLUB - All 9 issues of the early QL magazine from Sinclair. In actual fact some people say there were 10 issues, although "issue 0" was a 3 page typed introductory letter. Scanned as .PNG files, one page per file. Download each issue as a zipped collection of pages. 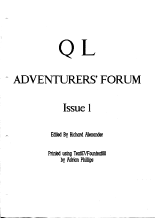 QL Adventurer's Forum - originally published by CGH Services. Scanned as .JPG files, one page per file. Download each issue as a zipped collection of pages. QL Leisure Review - originally published by CGH Services. Scanned as JPG files, one page per file. Download each issue as a zipped collection of pages. QL User and QL World - these were the best known QL magazines during those early days in the mid 1980s. These have been scanned into PDF files, note that some of them are very large file sizes. 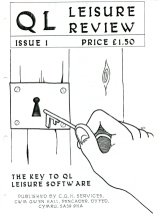 Originally, there were two QL User magazines, a short-lived one published as a supplement in Your Spectrum magazine by Sportscene Specialist Press Ltd and the second a stand-alone magazine published by EMAP Business and Computer Publications Ltd. QL User and QL World merged to form one magazine in early 1986. Currently incomplete, if anyone has PDFs of further issues of either magazine, please send them to me for inclusion here. Thanks to those people who have sent me scans of the currently available issues, including Klaus Frank, Albrecht Kleinfeld and Brian Kemmett. QL New User Guide (15MB) - From March 1991 to its final issue in May 1994, QL World ran a supplement called "The New User Guide". Totalling 138 pages, it was designed to complement the original QL user guide, presenting the subject from another perspective. Thanks to Klaus Frank for scanning this into one PDF document, and to Cristian on QL Forum for enhancing the scan quality while managing to reduce the file size. QL Today - Scanned copies of QL Today magazine, scanned by Rainer Wolkwitz, are available from Urs Koenig's website. The QL Super User Bureau was a fairly short-lived organisation for QL users. They produced an occasional magazine called QL SUB. Four issues that I know of were released, and these have been scanned by Brian Kemmett as PDF files.